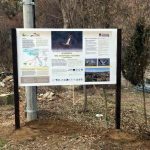 The Macedonian Ecological Society today installed a signboard under the “Egyptian Vulture New LIFE” project (LIFE16 NAT/BG/000874). 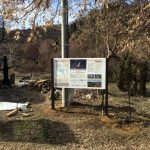 The content of the signboard is educational, and it contains information about the species ecology, distribution, interesting facts and the threats that the bird is experiencing. Mariovo with its unique geographic and climatic features has arguably the most suitable habitats for survival of this species in Macedonia, but at the same time this is where Vulture poisoning incidents are most frequent. 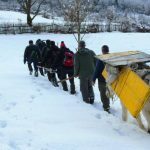 Having this in mind, we think that it is of upmost importance that we invest in education and awareness raising of the local population. This signboard is just one of the activities that are going to be implemented in the regions that contain the last strongholds of this majestic and globally endangered species.